Hydrostars is a 4-player minigame found in Mario Party 5. 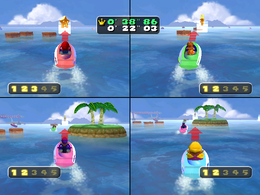 The four players, in their speedboats, drive up to the starting gate. The camera then zooms in on the player as the screen splits into four. Players in their boats attempt to drive through five numbered ring markers in order. There is an arrow indicating the direction of the next marker. If players hit one of the crates floating in the water, they are stunned for a moment. After driving through all five markers, players must still drive through the finish line to win. This minigame appears as the seventh minigame in Mini-Game Decathlon. Here, the player's objective is to finish the course as fast as possible to earn as much points as possible, up to a maximum of 1,000. The default record for this minigame in Mini-Game Decathlon is 00:52.64. Also, the minigame ends once all players finish, or 01:30.00 pass. The screen zooms in on the winner's screen, as they continues driving while waving. There is no ending in the Mini-Game Decathlon variation, the screen fades to white before the results are shown. Rules – "Steer the boat through all of the gates in numerical order. Whoever reaches the finish line first wins." Advice – "The arrows point in the direction of the next marker, so follow their lead!" This page was last edited on May 22, 2018, at 05:32.